HolaBank doesn’t just help you manage your money in Spain, they also negotiate deals and discounts on your behalf with a wide range of goods and services from leading brands. As an HolaBank client you get exclusive access to the Discount Club that helps your money go further. 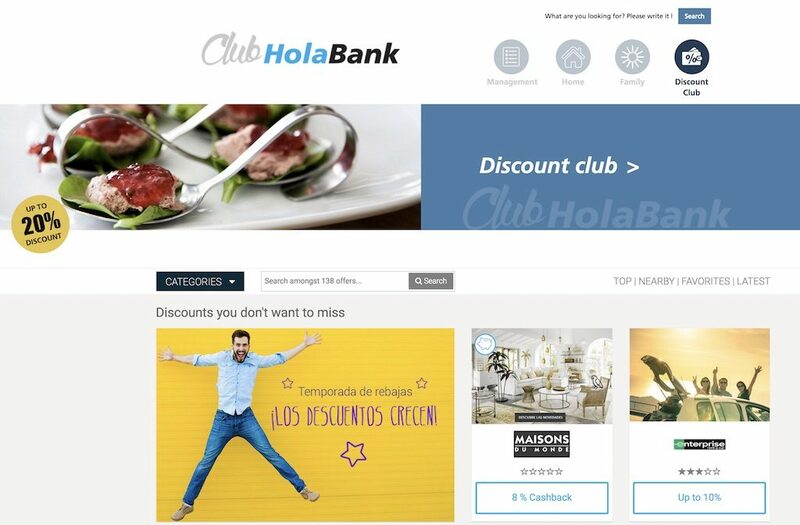 The HolaBank discount club already has more than 130 offers on many of the things you might need in Spain including leisure activities, sports, home decor, fashion, food shopping, car hire, petrol, and hotels, from brands like Hertz, Barceló, Iberostar, Pull&Bear, Asics, Quicksilver, Desigual, LG, Fnac, Cepsa, Yoigo, Clarins, & Philips, to name just some. You can get discounts or cash-backs purchasing online following links from the discount club section of the HolaBank Club website, or using codes or coupons when purchasing in shops. You also get to save money in a virtual piggy bank, where your cash-backs are kept until want to withdraw them as cash or use them for more purchases with great deals and discounts. Everybody loves a deal, and you get exclusive access to lots of them if you open an account in Spain with HolaBank, part of CaixaBank – one of the leading banks in Spain. HolaBank branches, and its website, are organised around the financial and banking requirements of expats and second-home owners from abroad, offering products and services tailored to their needs in English and other languages, including a selection of deals and discounts in the Discount Club that comes with an HolaBank account. Find out how HolaBank can help you with banking, mortgages, lifestyle, and, of course, deals and discounts in Spain. Click the banner below or call +34 91 832 98 98. To browse the discounts available to HolaBank clients visit the Discount Club page.